Cayuga practice went really well, with quality bites coming on both the YUM Vibra King Tube and Bomber Fat Free Shad crankbait. But, once again, once the tournament started I had to change my tactics. The first day I caught all of my fish on the Drop Shot YUM 4 inch Mighty Worm. On day 2, I caught a couple on the drop shot and then a couple more on the YUM Vibra Tube. 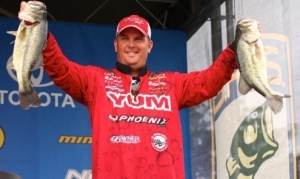 After Friday’s weigh-in I wound up in 53rd place, and sitting 40th in points going to into the AOY Championship. I’m planning on really doing my homework for the next three weeks. 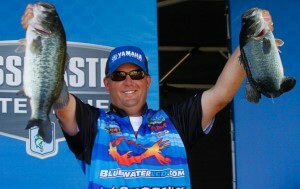 I sure want to make the Bassmaster Classic! Next stop – the Toyota Bassmaster Angler of the Year Championship tournament at Bay de Noc Escanba, Michigan, September 18-21. Wish me luck!